Homeless and a bit hostile, Mary Shepherd became a fixture in the London neighborhood where she parked her decaying van. Vagrant that she was, the feisty Shepherd eventually was allowed to park her van in the driveway of playwright Alan Bennett. Amazingly, both Shepherd and the van remained in Bennett’s driveway for 15 years. She sometimes popped into Bennett’s home to use the bathroom. She became a part of his life — albeit in frequently frustrating ways. 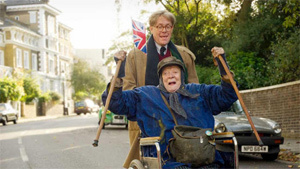 The Lady in the Van tells Shepherd’s story, which in 1999 became the subject of a Bennett-written play starring Maggie Smith. On screen, Smith reprises her role as a woman of demonstrative opinions and slovenly personal habits. Alternately exasperated and caring, Bennett (played here by Alex Jennings) tolerates Shepherd’s presence long past the point where most of us would have found a way to move her somewhere else. Director Nicholas Hytner, who directed The Madness of King George, which Bennett also wrote, sometimes shows us two versions of Bennett, both played by Jennings. One Bennett represents the writer; the other, a man trying to handle life’s ordinary burdens. Not surprisingly, they argue. If any actress knows how turn a line of dialogue into an ego-piercing dart, it’s Smith, and the material gives her ample opportunity to emphasize the spikiest parts of Shepherd’s personality. Additional plot currents appear: During Shepherd’s 15-year-residence in Bennett’s driveway, the playwright’s mother slipped into the fog of dementia. Bennett seems to pay more attention to Shepherd than to his own mother. I could have done without references to Shepherd’s decreasing bowel control, but, even in rags, Smith remains her estimable acting self. That self has a reliable candor, as well as a capacity to touch us. At one point in her life, Shepherd was a budding concert pianist. Smith makes us aware that something valuable has been lost in a life that has veered off the tracks. It may be more anecdotal than epic, but Lady in the Van should be welcomed for giving Smith an opportunity to add another memorable character to an already substantial portfolio.